I have over 175 books that deal with some aspect of the Peninsular War – from the campaigns, battles, sieges, guerrillas, uniforms, and unit histories, to numerous memoirs and diaries. Like many others, my collection focuses on the land forces and their campaigns, because with the defeat of the French navy at Trafalgar in 1805 it was essentially a land conflict. It was not until I read Wellington's Navy did I learn how vital of a role the Royal Navy played in the defeat of the French in Spain. Wellington's Navy is not the stuff of epic ship-to-ship battles. There were some actions, but these were mostly minor when compared to battles as the Glorious 1st of June, Cape Saint Vincent and Trafalgar. Instead, this book concentrates on more mundane things, such as transporting troops, maintaining a blockade of the Spanish coastline, convoy operations, and the support of land operations – whether conducting amphibious landings or landing supplies of Spanish guerrillas or providing men to man guns, ferries, or bridges. The Royal Navy takes a back seat to the Army in Sir Charles Oman's History of the Peninsular War and rightfully so, since the Peninsular War was essentially a land war. It is only when you take the separate contributions of the Navy as a whole, can you realize how important they were to the success of Wellington. Mr. Hall states that for "Britain's navy, the Peninsular War may be said to have started on 30 October 1807. On that Friday orders were issued to Rear- Admiral Sir Sydney Smith to go to Plymouth, there to assume command of a squadron for service off the river Tagus." This was both a military and diplomatic posting, for much of the Royal Navy's actions in the early stages of the Peninsular War were more political than military. Admiral Smith was only there for a short time before Vice-Admiral Sir Charles Cotton replaced him. Mr. Hall goes into great detail on two of their greatest political successes— the support they provided in assisting the Portuguese Regent in his escape to Brazil and thereby avoiding being captured by the invading French, and the delicate situation of what to do with the Russian naval squadron that was in Lisbon. He also briefly discusses the support the Royal Navy provided the British army that landed in Portugal. The years of 1808 – 1809 saw the Spanish rise in rebellion against French occupation and an increase in Royal Navy activity in and around the Iberian Peninsula. Mr. Hall covers a wide variety of topics including support for the guerrillas, relationship with the Spanish Junta in Cadiz, the secret transfer of the Spanish troops stationed in Denmark back to Spain, operations on the east coast of Spain, and the evacuation of the British Army at Corunna. 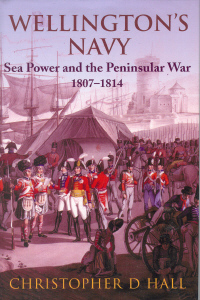 Additional chapters include naval support to the Army during the years it was on the defensive in Portugal (1809 – 1812). This included assistance in building the Lines of Torres Vedras, sailors to man bridges and ferries, manning forts along the coast and the Tagus River, and transporting supplies up the Tagus. The author also devotes a separate chapter to operations on the east coast of Spain – where much time was spent intercepting French grain convoys to Barcelona, assisting the besieged Spanish garrison at Tarragona, plus providing direct support to the British landing in 1812 at Alicante. Probably the greatest service the Royal Navy did for the Army was in the way of supply. Much of the food and fodder consumed by the army had to be imported. In a chapter called "Convoys, Bullion and Arms", the author provides a fascinating overview of the effort the navy made to ensure that the army was kept in supply. Initially, it was a fairly haphazard operation, but as the war went on, it became fairly sophisticated. Mr. Hall covers how the convoys were organized, how they operated both to and from England, and their numerous problems. (Despite the size of the Royal Navy, one of the continuous headaches for the senior naval officer at Lisbon was finding escorts for the convoys, for the captains of the naval ships went to great lengths to avoid the tedium of convoy duty.) This chapter also touches briefly on one of Wellington's major troubles – finding money to pay for the war. Not only did the money have to be found, it had to be shipped to the theater of operations. Ships were dispatched to Mexico, Cuba, and even to Peru to secure the money. Between November 1812 and July 1813, twenty-seven different shipments of specie were made. Regulations at that time authorized the "captains and flag officers engaged in bullion movement to claim a small but lucrative percentage of the total for themselves as freight money." Needless to say, there was no shortage of volunteers willing to assist Wellington in this endeavor! Wellington's Navy also covers the clandestine efforts of the navy to supply Portuguese and Spanish guerrillas. Many of these operations were along the northern coast of Spain and due to difficulties operating in the severe weather of the Bay of Biscay and making contact with the various independent guerrilla bands, they had limited success. Mr. Hall closes with the bridging of the River Adour in February 1814. This operation was truly a joint operation – with the Royal Navy being in on the planning from the very beginning. In little less than a month, the planning, designing, and acquiring of material to build a bridge of boats across a river 450 meters in width was accomplished. The bridge was built in three days under harsh weather conditions and within striking range of the French army. Not only was it a marvel of engineering, but also a classic example of what joint warfare can achieve when both services are willing to co-operate with each other. For those who have read Sir Charles Oman's History of the Peninsular War very little of the information on the land campaigns and political machinations will be new. The author uses Oman to lay the foundation for the book. He then draws heavily on Admiralty papers and other primary naval sources to show how the Royal Navy influenced the events he describes. Quite often he then supports his position by quoting from Wellington's Dispatches. Mr. Hall makes an excellent case for his position that the Royal Navy was a key element of the Anglo-Allied success in the Peninsular. His strong views on this matter however come across at times as having blinders towards the shortcomings of the navy. This is especially true when it comes to writing about Wellington's relationship with them. Although generally his relationship with his naval counterpart was very good, when Wellington did complain about any shortcomings in the support, Mr. Hall dismisses his concerns. In one case, he describes Wellington with "This attitude was a classic example of the military commander whose eyes are fixed solely on his own area of responsibility to the exclusion of everything else, a blinkered view that in his case seems to have been compounded by a complete ignorance of the difficulties being faced by the Admiralty. . . "
Wellington's Navy fills a big gap in current studies of the Peninsular War. It is exquisitely researched and extremely well written. While it is an essential book for the serious scholar of the Peninsular War, it is broad enough to hold the interests of those who do not specialize in this area of the Napoleonic Wars.